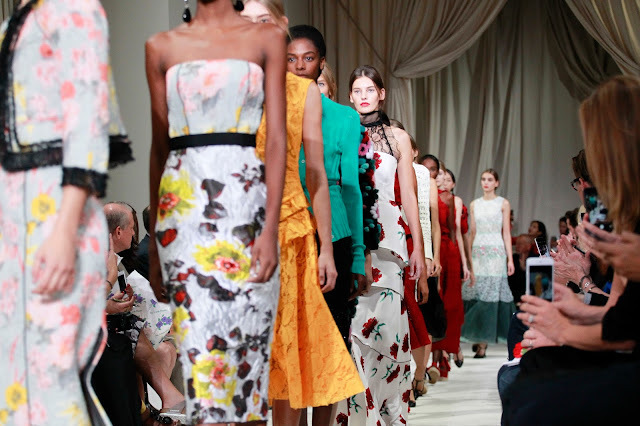 Peter Copping has been waving his magic wand at the house of Oscar de la Renta since he arrived last February. The English designer has been reworking the indelible codes of the house in a subtle, reverential manner. For his Spring 2016 show, Copping had a single carnation placed on every fuchsia-cushioned sea at the Prince George Ballroom. “I wanted it to feel like a couture salon and to bring that little bit of Paris and things that I am familiar with here to New York.” Honouring the past, while also preserving your own sanity. Copping is off to a good start. Spring 2016 was a stellar sophomore season, not only pleasing himself, Oscar’s past and passions were touched on here. The Parisian air was welcomed because Oscar worked there, as a couture assistant at Lanvin. His time spent with Cristobal Balenciaga were also touched upon. The Hispanic Society in Harlem, another reference point, concluded the preface to this Spanish-inspired fiesta of fashionable, timeless clothes. These weren’t clothes that were beset with an air of a designer treading lightly on the legacy of the former designer. These were confident, dramatic outfits. 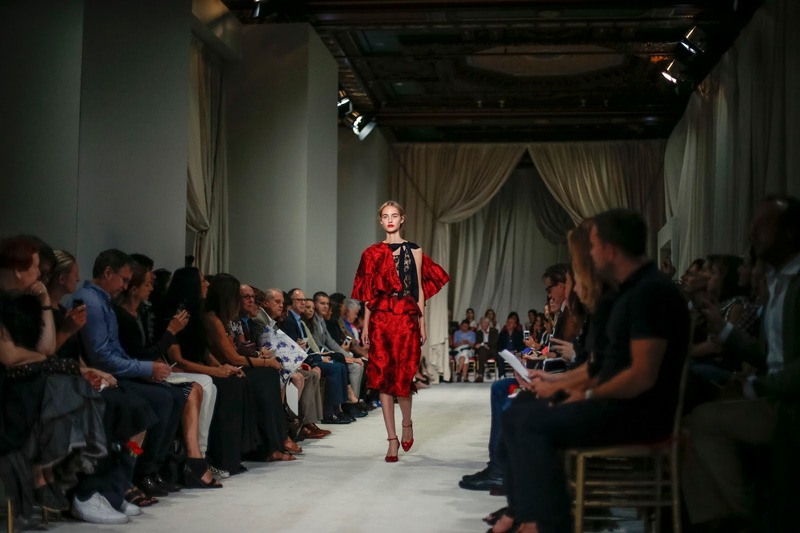 Vanessa Moody opened the show, guns blazing, in a fiery crimson two piece, followed by Maartje Verhoef’s matador-inspired capelet and ruffled skirt with a lace bodice. Tiny carnations emblazoned many a dress. A flamenco flavour was added via the embellished black accents on red backgrounds. The flaming carnation red imbued a spicy sultriness and burning passion. Frankly, it reinvigorated the house codes. Olé. Amidst the red looks, which came in droves, there was marigold, black, turquoise, lilac and blue. That’s where the magic touch began to descend on a slippery slope. The marigold hue of a wide-open-neck dress was garish. A layered lace lilac dress with an asymmetrical hemline was a bemusing addition to the line up. The drama was lacking. A navy aqua dress with a silk skirt had the drama, but lacked direction and it sat uncomfortably on the model. The evening gowns—that Oscar was famed for, as well as catering to the Upper East Sider—didn’t carry the memorable impact of an Oscar creation. There was an awkward lightness to them but they were weighed down by ugly colours. But if you $8000 lying about, then that light aqua silk gown with black grosgrain bows is yours for the taking. Peter Copping as creative director at Oscar de la Renta is a match made in heaven. 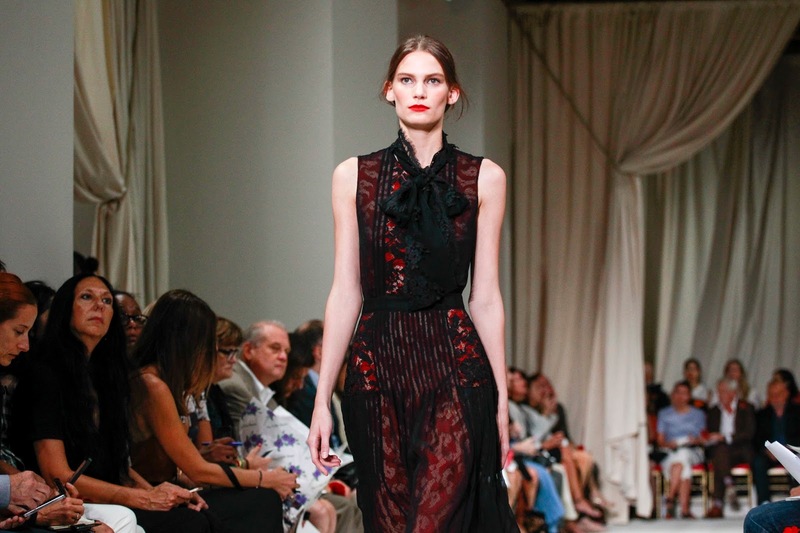 He brings a Parisian romanticism to a Spanish designer’s all-American, ladies-who-lunch, brand. 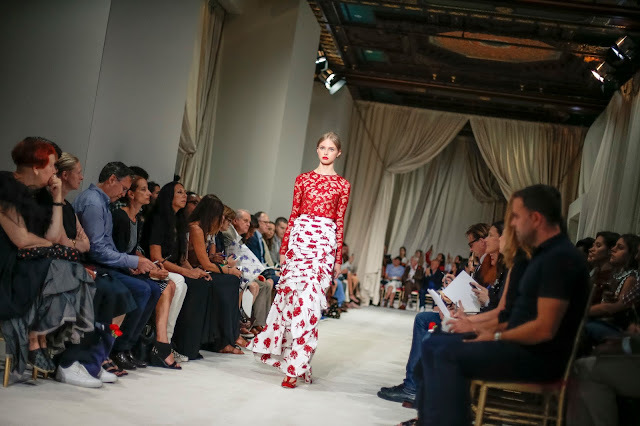 I was spellbound by the livid red hues at the beginning of the collection. Those clothes were magnificent. Then it deviated. The collection went off-track and the momentum was lost. What began as an impassioned, fiery portrayal of the Oscar woman became an unwanted sluggish daze.